Egyptian Cotton Sheets – Italy. When shopping for authentic Italian sheets, understand that just because a retailer lists sheets as Italian does not necessarily mean that they actually are. OBS recommends that you do your research, and remember this is a category where you get what you pay for, don’t be fooled by deceptive “low price” advertising by online retailers that can’t answer your questions intelligently about the origin of the brands they sell. In this category of luxury sheeting. 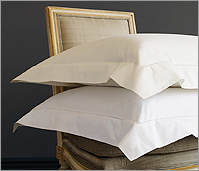 You should expect to pay between $600.00 to $1,350.00 for a queen size 600 thread count Egyptian cotton sheet set. 100% Italian Egyptian Cotton, Woven in Italy 300TC, 400TCor 600TC, true Italian craftsmanship. 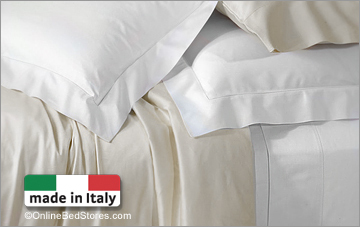 Analisa, 100% Egyptian Cotton Percale, Made in Italy, Colors: Ivory & White.